I've used Anki for a while but the customizations can become complicated. My flash cards were piling up and it was becoming unmanageable. This app is beautiful, really easy to use, and the graphics make the words tangible for visual learners like myself. 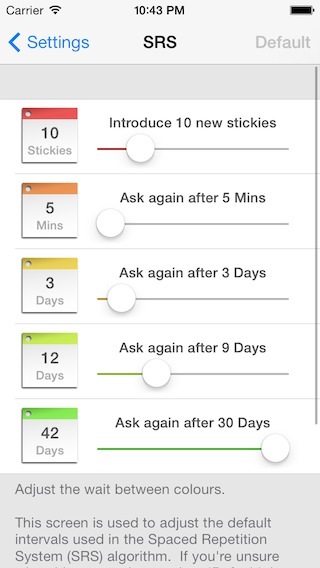 Released in 2008 with over 100,000 downloads, StickyStudy makes study time addictive. Another way to view all your data: a standard list with a scroll bar. As with tile view, instant, lag-free scrolling. More settings and customisation than you can shake the proverbial at. Complete vocabulary and hanzi for all 6 levels of the new Hanyu Shuiping Kaoshi exam. Around 2000 pinyin and 8000 vocabulary audio samples recorded by native speakers. Need more content? Import your own by typing directly into the app's import box or copy/paste from an email, etc. ✩ Universal app. iOS8+. iPad Pro ready. 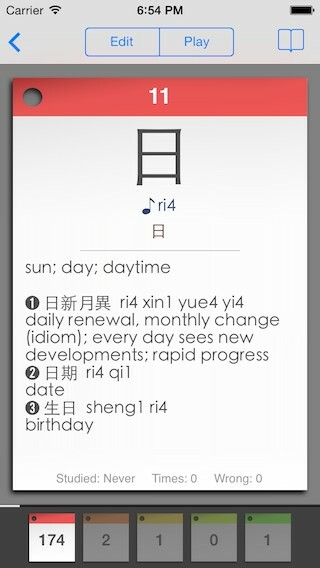 ✩ "Launch Pad Pro" = "stickystudychinese://"
"Brilliant app! For learning HSK this app is invaluable, really well made. Never usually review apps but had to for this." 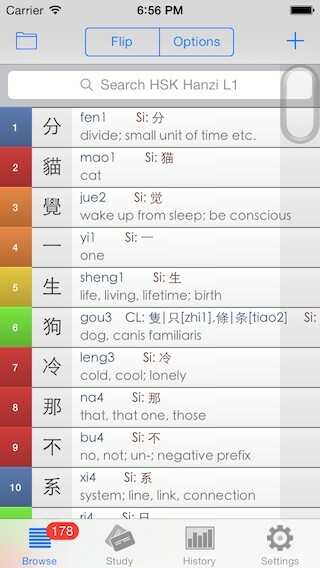 "Simply the best app for study Chinese on iphone. " "THE best app for studying hanzi! I've tried dozens of apps for studying Chinese and this is the best, hands down. I love the interface, it illustrates your progress beautifully ... There's no lag either, even with tons of stickies. Love it, totally epic." 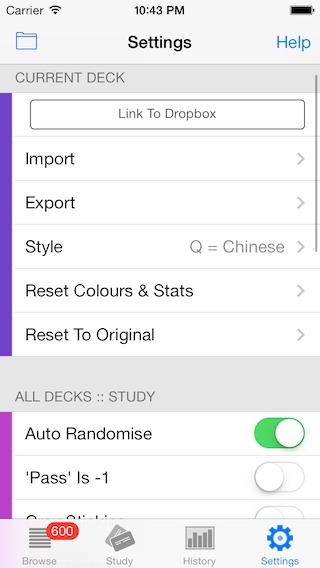 "An amazing HSK study app. I can speak and understand Chinese, but can't read or write. I was looking for an app to help prepare me for HSK level 3 reading and writing. It not only had to be easy to use, but also comprehensive with the vocabulary. This app did the job. 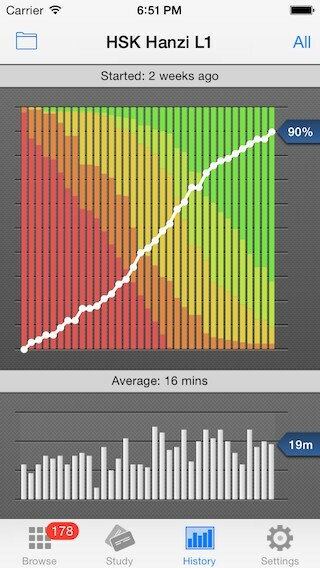 I took the test today and this app was the only study tool I used (other than sample practice tests)." "Simply amazing. The right app to study Hanzi, Highly recommended to learn Chinese." "The best flash card app. 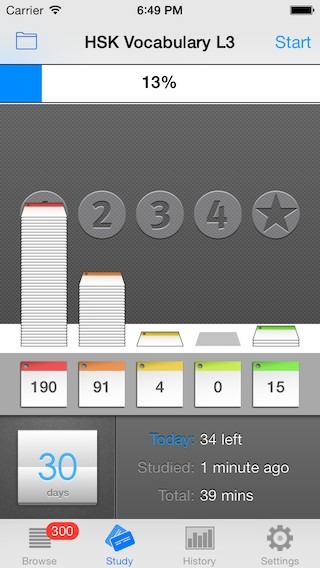 Simple, great interface, several ways to view your progress, best I have seen." "If you want to study hanzi for the HSK, this is the app to get. Not too complex so you dont spend all your time trying to get it to work, but just enough depth so it does what you want it to. The app just gets out of the way, so you can focus on your studies. I have Flashcards Deluxe, but this is the one I keep coming back to!" "Excellent! A very efficient way to remember your hanzi. The best flashcard program I've ever used." "Really good and worth the money." "Perfect for studying. Love how it tracks progress and has so many options for customizing. I am taking the HSK test in a month, so glad I stumbled across this gem. The audio is great too!" "Thanks for the update. My best app ever!!" "The most beautiful app I own. I have tried to learn Chinese from a very young age but I have never achieved it. My parents were born and bought up in China but I was born here ... Since I am now at University, carry my iPhone everywhere and have recently discovered how helpful apps are, this app has become invaluable to my study. Thank you for taking the time to create this app. Maybe someday I can type a review in Chinese.."
"Perfect app! absolutely worth the price. helped me through HSK 3 and 4!" "An excellent resource for Chinese language learning. It's also very useful for the students in their HSK preparation. Good work." 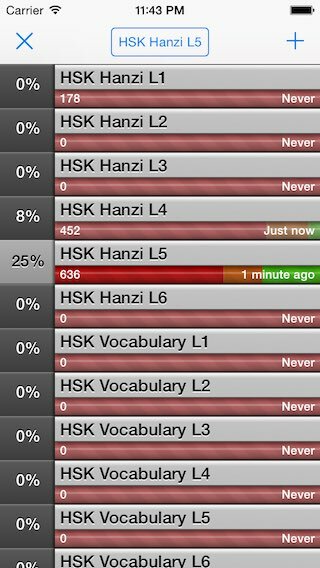 "This app is a great no nonsense way to learn the HSK hanzi. The interface is simple and effective and the app shows your progress clearly. You wont regret this purchase." "Easy to use with the default character decks (HSK 1-6 and TOCFL) and graphically well designed. But I didn't realize how powerful it was until I started building my own custom decks. It is entirely customizable with a quick bit of learning some coding." "Best Chinese flash cards. This is the best app I've found for studying Chinese hanzi with flash cards. There is audio for those of us studying without native speakers and the option to customize cards (traditional vs simplified for main display or pinyin number vs accent tones for pinyin display) as well as the option to create new cards. The algorithm used to handle "new" and "learned" entries has really improved my learning speed. I also love the "map" layout of the main browse screen, which allows me to see my progress at a glance. Good value for my $!" "Good app. It is a good layout and the studying has definitely helped me to keep up with things while on the go. I can't believe I spent hours writing down Japanese kanji years ago Kudos to the creator, it is a good effort and very helpful." "It's been invaluable in helping me prepare for my HSK exams and one of the few Chinese learning apps I have actually purchased and continued to use for a prolonged time." 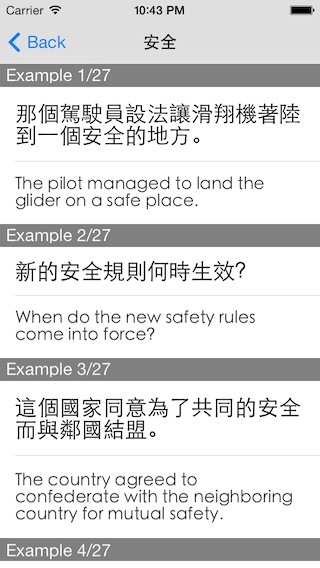 "This app is great for HSK preparation and also very useful if you're taking classes. I've recently started creating my own cards based on a class and the results are great." "This app helped me 100% to learn all the vocal required to pass HSK 5. Thanks! 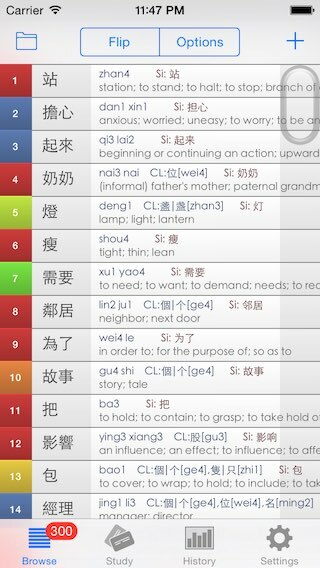 I am now using it to learn HSK 6." "Super fast and easy way to learn. A+"
"Best app. This app is great because it repeats in a way you keep getting the ones you don't know and less often the ones you do." "Brilliant!! This app is what I have been looking for. The most efficient flash card app ever." "Easy to use. It's true what someone said, the app gets out of the way and just lets you study. No frills, no complications." "Traditional Option Across All Cards. Did I mention how amazing this is? Now I can study HSK." "Study Schedule. The calendar function is actually very handy. I can plot out cards and plan daily targets." "Best one out there! I love this app! Simply the best way to learn to recognize and pronounce Chinese characters. Fantastic development job and user-friendly interface. Enjoy!"